1. Cook the biscuits as per pack instructions and allow to cool completely. 2. Place the raspberries into a bowl, reserving a handful to serve. Sprinkle them with the fruit sugar and pour over the lemon juice. Allow to macerate for 10 minutes then, using a liquidiser or hand blender, blitz the fruit until smooth. 3. Pass the raspberries through a fine sieve to remove the seeds, as shown, left. Decant the sauce into a serving bowl and keep in the fridge until required. 4. Leave the ice cream to soften slightly, and place a scoop in between two of the biscuits and carefully squeeze them together to flatten. 5. 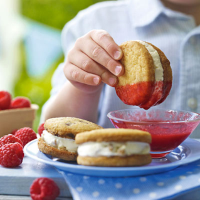 Arrange the ice cream sandwiches on a plate and serve with the raspberry dipping sauce and fresh raspberries. If you’re short of time or fresh raspberries are out of season, use the ready-prepared Waitrose Seriously Fruity Raspberry Coulis. Pair this dessert with delicious Waitrose Elderflower Cordial. We recommend a refreshing soft drink to accompany this dish. Browse our soft drinks aisle. (opens in a new window).